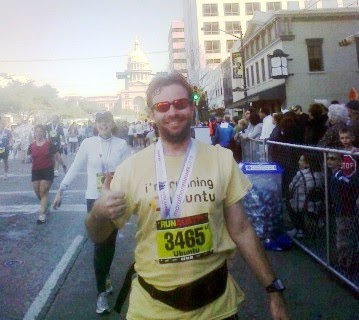 From the Canyon Edge: 2010 Austin Marathon - I'm Running Ubuntu! So yesterday was Valentine's Day, of course. Let's hope you treated your sweetheart extra sweet. Kim bought me a bottle of 14 year old Oban single malt Scotch whisky. Mmm, peaty. I've trained with Steve Sisson's Rogue Training Systems (and Runtex University) in the past. These guys have excellent programs for new runners. They can absolutely get anyone who can run/walk 3 miles to completing a marathon with about 6 months of hard work. 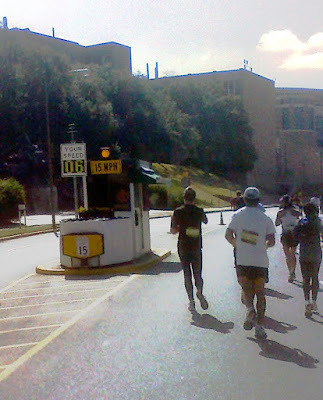 My personal best marathon time was 4:08 in the 2006 Austin Marathon. I was hoping to beat that time, but simply enjoying the race was the real goal. For the first time, I actually ran the race with my camera/phone (Palm Pre). This was pretty cool, as I was able to communicate with my wife, and help coordinate the places where she'd meet us along the way. I was also able to snap some pictures along the way. 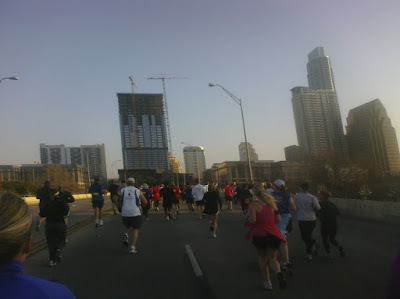 The race started at 7am, with a temperature of about 40F (4C), a bit chilly for Austin, but still pleasant running conditions. Clear, clear, clear, without a cloud anywhere to be seen. 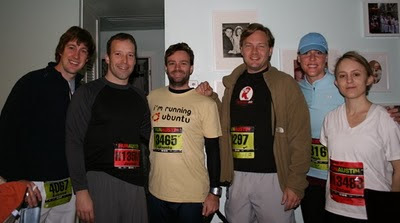 Of course, I ran in my I'm Running Ubuntu t-shirt. 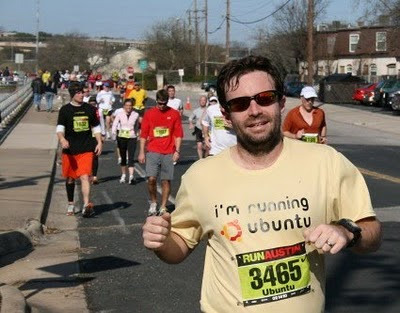 Let me just say that Ubuntu is live in strong in Austin! I must have gotten 30+ Ubuntu catcalls over the course of the run! Josh and I first saw our support crew (Kim and Gerri) having run uphill for about 2 miles, but still feeling great! 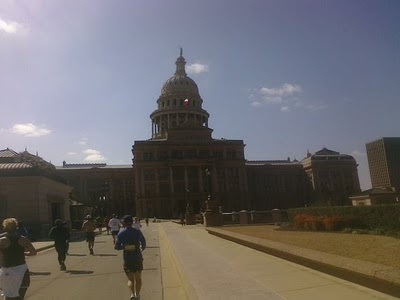 After another mile or so uphill, we hooked around, and headed back downhill toward downtown Austin. 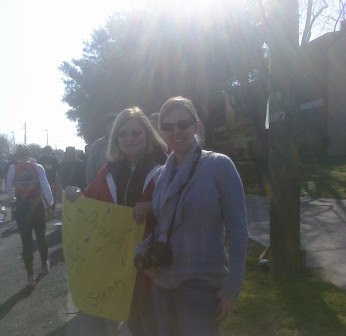 We were supposed to see Kim again around mile 7-8, but with the roads blocked, she couldn't make it. About an hour into the race, the temperature had increased a bit, and it was time to peel off a layer. Miles 1-3 were uphill, but 4-8 were nice and downhill. Moreover, the density of runners split in half between miles 10 and 11, as the Half Marathoners motored on toward the finish line, leaving us Marathoners to a few more hours of fun. Up until the 13 mile mark, three of us (Josh, Steph, and myself) ran together, chatting it up. Unfortunately, that wasn't to be the rest of the race. Josh had some severe leg cramps, dropping behind right around the 13 mile mark. Steph and I picked up the pace a bit (per our race plan) for the next 3 miles or so, but I could tell that I wouldn't be able to hold that for the rest of the race, unfortunately. So I wished her luck, and we each slipped into our own pace, just trying to make the finish line. I think miles 16 and 17 were the hardest two of the race for me. These were along Great Northern Drive, a 2 mile, perfectly straight, perfectly flat, perfectly boring stretch that any technical runner in Austin probably knows. It eats your psyche. 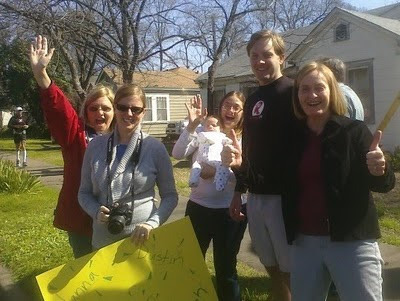 Thankfully, Kim and Gerri were cheering me on at mile 17, and boy did I need it! I was already a bit off my goal time, so I decided to just enjoy the race. I stopped for a good 60 seconds or so to wish my wife a happy Valentines Day, thank her for being there, and find out how my friends ahead of me were doing. It was nice to get a bit of a recharge, and I was able to ride that for a mile or two. 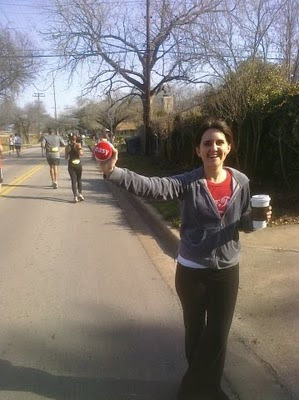 But around mile 20, I started to feel fatigued. 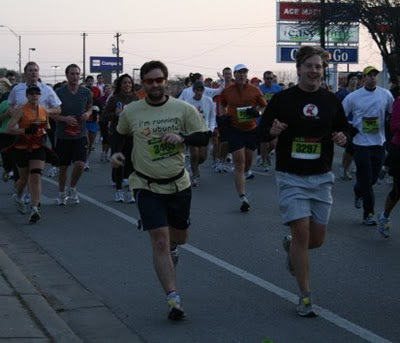 For each of my previous 3 marathons, I ran at least one 22 mile long run before the race. I missed my team's 22 miler (while I was trekking through New Zealand). Fortunately, I made a random friend. It's a great thing to do during a race. Find someone else to chat with. I met a guy named Ed. This was Ed's 53rd marathon, and 3rd in the last two months! Holy smokes. Ed was also a class of '82 Aggie (myself being a class of '01 Aggie). We Howdy'd and Gig'Em'd and Whooped our way through the next few miles. And I tried to learn as much as I could from a guy who had run 52 previous marathons. I lost Ed during one water stop, and started struggling a bit, until I made it to mile 24, where Kim, Gerri, Steph, Josh who had to drop out of the race due to leg cramps :-( and my newest nephew Jackson! Again, I was well out of contention for breaking my best time, so I stopped running, and spent a minute thanking everyone for their support. They encouraged me to hit the road, which I did for the best miles 25 and 26 of any marathon I've ever run. A few blocks later, then past National Museum of Texas, the Texas History Museum (great exhibits, if you're ever in Austin looking for something interesting to do)! 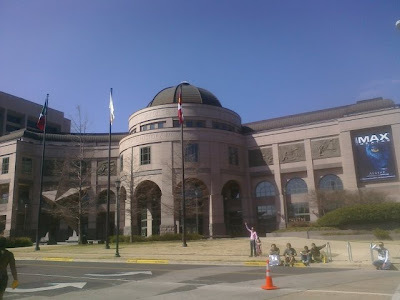 And just past the Texas History museum stands the enormous Texas State Capitol in its gleaming pink granite. The finish is near! After a half lap around the capitol building, the finish line stood two blocks down, at Congress and 10th Avenue. A huge crowd awaited on the south side of the capitol, cheering all the way to the finish. Four hours and thirty minutes later, I had covered twenty six point two miles on foot. I had just completed my fourth marathon. Not my fastest time, but not my slowest time either. But I was proud, happy, and healthy. And finally, back to Josh's house where we started oh so long ago that morning for the post race banquet and beers! Congrats Dustin, sounds like it was a hot one! 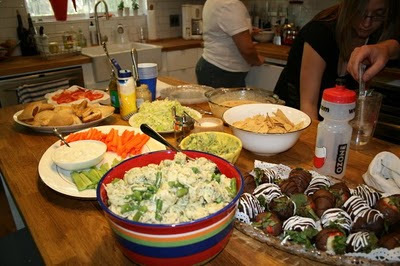 Do you have a rule about how much water you take on during the race, and what about snacks (I see you're running with some sort of bag)? The temperature was actually really pleasant! The most important hydration you can do is in the days before the race. 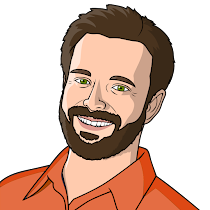 I drank over a gallon of water and electrolytes in the 2 days before the race, and cut back on coffee and alcohol for the week of the race, to help stay hydrated. For a marathon, I try to take water every 2 miles, and Powerade/Gatorade/Electrolytes at least every 6 miles. 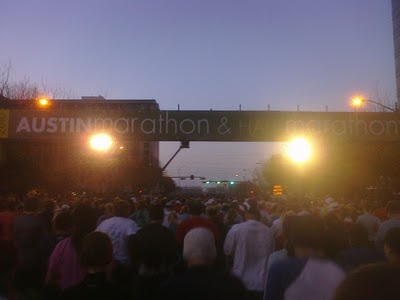 The Austin course was amazing, with water basically every mile, and after the halfway point, electrolytes ever other mile. That's a lot of support! 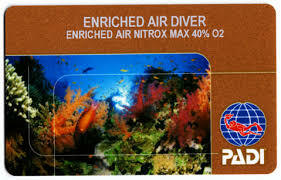 As for snacks, during a marathon, I like to take about 3 gel shots (usually the Cliff ones). This race, I took them at miles 8, 16, and 22. These are about 100 calories of instant energy, and they provide a nice coating over your stomach to stave off hunger pains. However, there are good people on the course giving out snacks of all kinds. I saw gummi bears, starburst, jolly ranchers, twix, snickers, and beer! The best treat though, are fresh orange wedges. For races or runs less than a full marathon, I typically take water about every 4 miles. A bit of powerade is nice around mile 13-15 (if going longer than 15 miles). Just found your blog by googling for myself. Congrats on finishing the marathon, and thanks for the shoutout and photo. 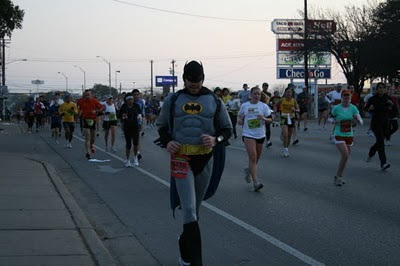 (The guy who ran as Batman).